Toshiba's Storage Device Division has unveiled what it claims is the first portable hard drive with 200GB worth of storage space. 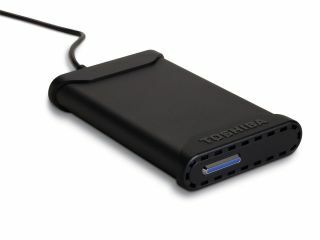 The single 2.5-inch hard drive offers the "highest capacity of any backup solution" in the compact hard drive market, Toshiba said. It features a special shock mount system which protects against normal wear and tear, and is housed in a scratch-resistant black aluminium case. Measuring 23.65 x 88 x 142.08mm, the 200GB version of the Toshiba USB 2.0 Portable External Hard Drive comes bundled with NTI Shadow backup software, which is PC and Mac compatible. Maciek Brzeski, vice president of marketing at Toshiba SDD, said that the concept of bundling backup software with a portable hard drive was important to businesses and consumers at the lower end of market as they have only just begun to grasp the need to preserve critical business and personal information. "We have addressed a critical need for preserving digital memories for years to come with a high-capacity, easy-to-use solution that takes the mystery and worry out of data backup," Brzeski said. Prices for the drives start at $130 (£65) for the 100GB version, while the 200GB will retail for $230 (£115).